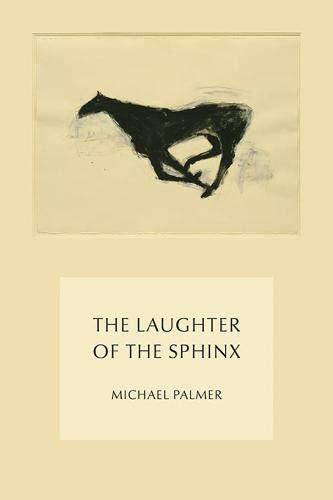 Michael Palmer’s latest volume of verse, The Laughter of the Sphinx, is decidedly eclectic. Despite Palmer’s early association with the Postmodern projective verse theories of Charles Olson, his subsequent and continuing development as a poet has transcended attempts at specific labeling. The simple reality is that his work is fresh but finished, intuitive as well as sophisticated, hallmarks of a mature poetic sensibility. Deeply influenced by Robert Duncan and Robert Creeley in the 1960s, Palmer has proved to be an unselfconscious verbal artist who transliterates and transcribes the visual and the auditory into words, words organized into lines that employ Olson’s breath unit considerations, words that are a testament to Palmer’s retrospection and introspection at all levels. Palmer’s poems are filled with motion and music, with light and darkness. The poem, “Let Us Ravel the Silence,” for example, is ekphrastic, based on the pastel, “The Emperor’s Bridge,” by Irving Petlin, “. . . a hum, after all, of no sound,/a buzz of absent bees,//a swirl of sky licked by flame/.” Palmer seems to enter this visual artwork, walk into its world, and translate it back for us in a way that is indicative of the range of his vision, the impact of that vision somehow implied before it is felt. Palmer’s work is not without experiments, and this volume is no exception, containing as it does a mix of free verse, prose, irregular rhyming, and a panoply of line-width and line-breaking variants. In most instances, this stylistic variation avoids the appearance of pastiche. In the title poem of the collection, “The Laughter of the Sphinx,” Palmer conjures “sad-eyed scholars and mournful scribes/” and in the air, “the laughter of the Sphinx/endlessly riddling, endlessly echoing,/.” Given the destructive changes in the world, the distance of the received and sacred orders, the development of a new restlessness and disorder—an era of new uncertainties—why wouldn’t the Sphinx be laughing? The series “Light Moves (1—6),” based on Palmer’s collaboration with the Margaret Jenkins Dance Company and their performance of the dance, “Light Moves,” continues Palmer’s focus on the ekphrastic relationship between and among the arts. “Light Moves 2,” for example, textualizes light and the motion of light, “. . . sexual suns, curved/and fretted light, lies of that light,/” the entire concept of light doubling back on itself, shadowing the fretwork of the dance, the limitless fretwork that the bodies of the dance have become. “Sounds for Times Bones” is based on another of Palmer’s collaborations with the Margaret Jenkins Dance Company, “The King of Pentacles/and the Queen of Wands . . . ” dancing while “The Book of Hours dances in solitude,/” time dancing through the motion of its own solitary light. Fire is at least as important as light and music, darkness and voice, in this work. “It rained dry rain within this poem/at the gate of stone/and snowed a snow of burning words/” (“Untitled”). Palmer’s often spare lineation, his accessible vocabulary and syntax, belie the complex metaphysics of these supple poems. Each piece is an exercise in semiotics—a study in the way meaning is held within words, bodied forth in poetry. In the poem, “Strange Now,” the poet finds it curious “to lose ourselves in this slowing time/of a late, lateral light,/a slant, abbreviated light/,” the fires tamped down, the motion slowed, a poem of remembrances, dedication, its apparent randomness tending toward acute resolution. In the poem, “Falling Down in America,” Palmer reverts to the gritty realism of the now, wryly focusing on the reality of aging in the United States. Palmer’s final sequence of poems in this collection is entitled, “Still (A Cantata—or Nada—for Sister Satan),” a series of poems intended both for the page and to be sung. “And the children, with their knowledge of death,//place sound upon sound/stone upon stone/fire upon flame/,” Palmer returning here to the circularly repetitive themes of sound and fire, death and darkness, light and music. This book is, after all, about time and the evanescence of time. Palmer does not reach conclusions. He does not instruct. He transcribes with a lucent clarity; he transcribes in poems that echo the motion and the music, the darkness and the light.